Where to stay in Amsterdam - Hotels, Apartments, Hostels or Houseboats? Trying to find where to stay in Amsterdam can be like trying to find a needle in a stack of lower quality needles. With so many hotels and hostels in the city, sorting the great from the grotty is essential; and with that in mind we have compiled a list of some of Amsterdam's accommodation gems, any of which could make for a wonderful stay. Hotels in Amsterdam range from expensively exquisite to cheap and cheerful, and everything in between. Knowing where to stay in Amsterdam means knowing the best hotel to suit your needs and pocket. 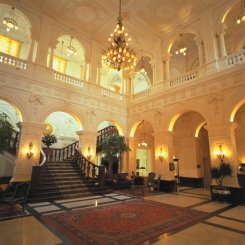 For top class accommodation, the five-star Grand Hotel Amrath can be a great choice. Its Art Deco design and central location at Prins Hendrikkade 108, as well as the welcoming, professional staff make the Van Eijl family's Amsterdam hotel popular with both business and leisure travellers. Grand Hotel Amrath is walking distance from the Nieuwmarkt, the Rembrandt House and the Jordaan and is close to the Red Light District without being too close for comfort. If you want to know where to stay in Amsterdam without breaking the bank, the city has some great budget hotels that offer clean, simple accommodation. Hotel Quentin at Leidsekade 89, is a charming and friendly little hotel with tidy, if somewhat small rooms right beside Leidseplein and walking distance from the major museums. For something closer to the Red Light District, check out Travel Hotel Amsterdam with its basic facilities and 24-hour bar at Beursstraat 23. Want to find something a little different? The Backstage Hotel at Leidsegracht 114 is a uniquely music themed hotel close to the concert venues of Melkweg and Paradiso that specializes in providing accommodation for bands. Music lovers are welcome. 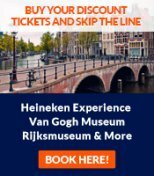 For groups, deciding where to stay in Amsterdam can sometimes have more to do with the party atmosphere than the facilities. Amsterdam's hostels may not have the privacy and comfort of hotels, but most have a bar or at least a common room filled with like-minded young people out to have as much fun as possible. 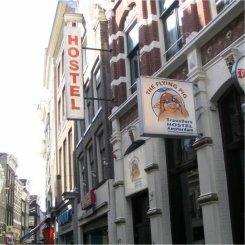 The Flying Pig is one of Amsterdam's most established and well respected hostels, with two locations in the city and a third by the beach in Noordwijk. The hostel offers dorms, including one for girls only, and lively bars to socialize in. The atmosphere is laid back and their policy is "one price covers all". Check out the Uptown at Vossiusstraat 47 near the party district of Leidseplein or the Downtown at Nieuwendijk 100 , close to the Red Light District. Some other hostels worth a look are Bob's Hostel at Nieuwezijds Voorburgwal 92 , or the Stayokay hostel chain, which has locations beside Vondelpark at Zandpad 5 , in the city centre at Kloveniersburgwal 97 and a large facility in the eastern area of Zeeburg at Timorplein 21. This is a city of canals, and the search for where to stay in Amsterdam is not limited to land. There are plenty of companies in Amsterdam that rent out self catering apartments and houseboats, which can be perfect for a group getaway. Amsterdam House rents houseboats along the Amstel in addition to their hotel and apartments. Apartments and houseboats are all in and around Rembrandtplein area, which makes this a nice choice for clubbers and partygoers; during Amsterdam's Gay Pride celebrations the location is particularly good. Their offices can be found at 's Gravelandseveer 7. There are many other houseboats and apartments for rent in Amsterdam such as, Amsterdam Houseboat, and Amsterdam Houseboat Lady Luck. The Houseboat and Apartment Hotel offers apartments and houseboats in various locations throughout the city, great for when you're not sure where to stay in Amsterdam; visit their website at www.houseboathotel.nl. Another good option is City Mundo, found at Schinkelkade 30 who also offer a great selection of short term rentals.